Our progressive activist round-table in the studio! Your guests today are Brian Hedden, Alex Pellitteri, Mallory McMahon, and Rachel Posner. Get ready for our final NY-11 wrapup episode! We’ve heard from all eight Democratic candidates for New York’s 11th Congressional District on the podcast. We’ve given each candidate unrestricted time to discuss themselves and educate us on any issue of their choice. Boyd Melson, Michael DeVito Jr., Mike DeCillis, Zach Emig, Max Rose, Paul Sperling, Omar Vaid and Radhakrishna Mohan have lent their voices to the podcast. But to wrap up, we’re turning the mic over to you! Today, we have a powerhouse of progressives in the studio to talk about issues we care about. Join in with a five-person cross-section of neighborhood activists as we educate the candidates about the things we wanted to hear about, such as transit, the environment, Brooklyn/Staten Island unity, the (possible) myth of the moderate voter, women’s health issues and paid family leave, foreign policy and immigration, refugees, the inequalities inherent in the fundraising process during primaries, and much more. If you want to get involved and make friends with the guests on the panel, feel free to check out our list of progressive neighborhood organizations! And don’t forget to check out Fight Back Bay Ridge’s massive NY11 candidate questionnaire for even more info about the candidates! There are two awesome events coming up in Bay Ridge at the Stand4 gallery at 414 78th street. First up is their ongoing exhibition “Amazon: Invisible Landscape” every Saturday between April 19th to May 31st. 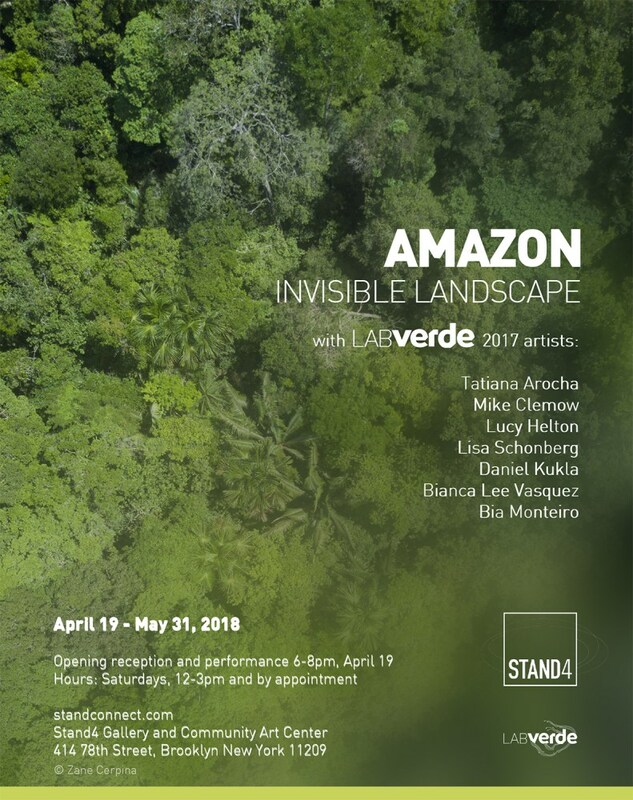 It explores the connections between science, nature, and art from the point of view of seven unique artists who completed a residency in the Amazon Basin with LabVerde. The gallery is open from 12pm to 3pm or by appointment. Head over and check it out, it’s awesome! Also at Stand4 this Friday, April 27th, is a retrospective of the late Gilbert Sorrentino. If you listen closely to our episode “Going Nativist“, you can actually hear Jack mentioning that Skinflints used to be called Sorrentino’s in the 1950’s! There will also be a discussion of the state of arts and literature in the neighborhood, so if you have a literary bone in your body head over to the gallery at 7pm! We opened the show by talking about John Quaglione’s tweet insinuating that the Universal Pre-K program is wasting funds and/or is a failure due to a (presumed) lack of admissions. Our senior correspondent for education Erik Shell took particular affront to this odd complaint, so we spent some time discussing how early childhood education is vital for our district, and how even if Quaglione’s assertions are correct, an availability of seats is nothing to bemoan in a district where seats are at a premium. John Quaglione’s Tweet wondering if there are an overpopulation not of students, but of free, available seats. We also spent some time discussing the news that both Donald Drumpf Jr. and Sebastian Gorka have been invited by the Brooklyn GOP to headline a fundraiser at the Dyker Beach Golf Course. If you haven’t heard of Sebastian Gorka’s particular brand of hate, it’s widely available… most specifically, his propensity for wearing a medal with strong anti-Semitic and neo-nazi connections and his involvement in extremist dictatorships. Dan spent some time lamenting the sad decline of the leadership in the Brooklyn Republican Party, mentioning how it is entirely controlled by Senator Marty Golden at this point to the exclusion of other voices. Remember to use the hashtag #NotInMyBK if you think that the invitation by the Brooklyn GOP doesn’t represent your beliefs or your neighborhood! Oh, and before we forget, you can visit our Facebook page to learn about how to set yourself up with a free temporary profile picture frame that shows that you stand against hate, islamophobia, and antisemitism in our neighborhood! We also spent some time talking about the latest petition drama occurring over in our NY-11 race, specifically concerning petition challenges against multiple congressional contenders. We mention Zach Emig’s attempts to get to the bottom of the matter. You can watch Zach at a recent Town Hall asking Omar Vaid, the assumed challenger of the petitions, point-blank about the issue. He also posted documents gained from the Board of Elections about the challenge, which we feel are relevant to the conversation. We want to stress again that none of this is confirmed until a candidate admits to the challenge, however, most evidence seems to support Emig’s view. This episode was recorded in our Bay Ridge studio with senior correspondent Erik Shell and co-host Daniel Hetteix. Post-production and editing was by Daniel Hetteix.